I wrote this pattern in 2012. It has been lost and now I am able to repost it. Please let me know if you find any errors in this pattern. Enjoy! From a lace pattern, you can make a pretty bookmark just add a tassel or fringe with decorative beads. 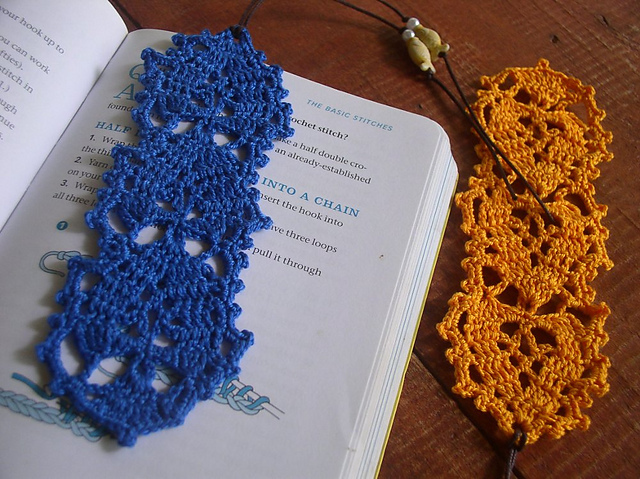 This bookmark is crocheted with cotton thread size 8 using a steep crochet hook size 1mm. 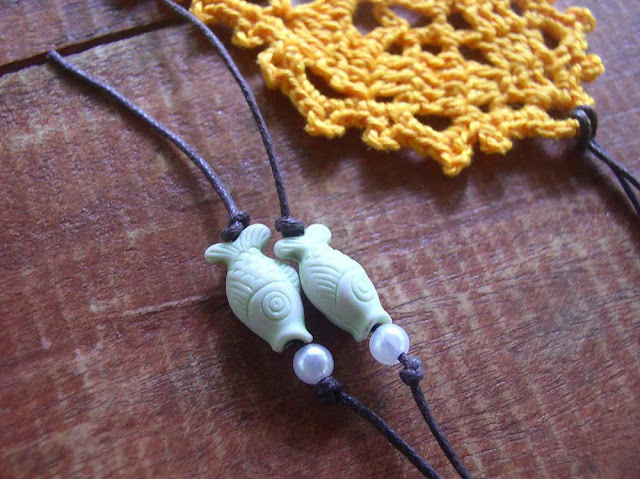 Make these bookmarks for yourself or as gifts or to sell in your handmade store. Errata: Row 4 should read: Double crochet in each of next 4 double crochet, chain 3, single crochet in 3-chain space, chain 5, single crochet in next 3-chain space, ch 3, double crochet in each of next 4 double crochet, chain 5, turn. Double crochet together over next 3 double crochet dc3tog: [Yarn over, insert hook in next stitch, yarn over and pull up loop, yarn over, draw through 2 loops] 3 times (4 loops on hook), yarn over, draw through all loops on hook. Chain 7, slip stitch in first chain to make a ring. Row 1: Chain 3, 4 double crochet in ring, chain 5, turn. Row 2: Double crochet in first double crochet, 2 double crochet in next double crochet, double crochet in next double crochet, chain 3, double crochet in same double crochet, 2 double crochet in next double crochet, double crochet in top of 3-chain, chain 5, turn. Row 3: Double crochet in each of next 4 double crochet, chain 3, single crochet in 3-chain space, chain 3, double crochet in each of next 4 double crochet, chain 5, turn. Row 4: Double crochet in each of next 4 double crochet, chain 3, single crochet in 3-chain space, chain 5, single crochet in next 3-chain space, ch 3, double crochet in each of next 4 double crochet, chain 5, turn. Row 5: Treble crochet in first double crochet, double crochet in each of next 3 double crochet, chain 3, single crochet in 5-chain space, chain 3, double crochet in each of next 3 double crochet, treble crochet in next double crochet, chain 8, turn. Row 6: Treble crochet in first double crochet, double crochet together over next 3 double crochet, in 3-chain space make (2 half double crochet, single crochet), single crochet in next single crochet, chain 7, slip stitch in single crochet to make a loop, in next 3-chain space make (single crochet, 2 half double crochet), double crochet together over next 3 double crochet, treble crochet in next double crochet, chain 6, turn. Row 7: Double crochet in treble crochet, in 7-chain loop make 5 double crochet, chain 2, slip stich on 8-chain loop, chain 2, turn. Row 8: Double crochet in first double crochet, 2 double crochet in next double crochet, double crochet in next double crochet, chain 3, double crochet in same double crochet, 2 double crochet in next double crochet, double crochet in last double crochet, chain 2, slip stitch in 6-chain loop, chain 2, turn. Row 9-17: Repeat rows 3-8. Row 18-22: Repeat rows 3-7. 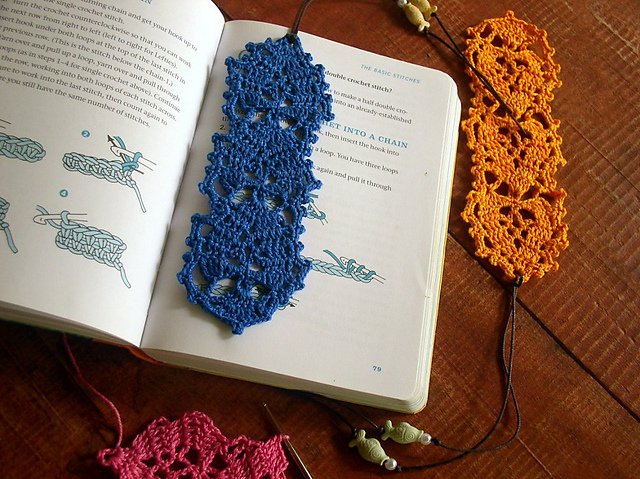 Border: Make (chain 3, picot) evenly all around the edges of the bookmark, except at the 7-chain ring at the tip of the bookmark where you make only single crochet without picot.